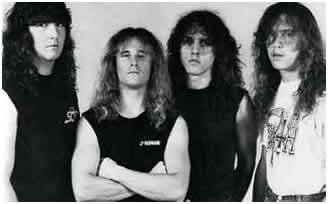 December 13, 2001 - This date will always be remembered by metal fans with suffering and longing. The founder of Death lost his battle against cancer and nobody could believe it. He was a hero for most headbangers, and heroes don't die, right? Maybe this is not the truth. 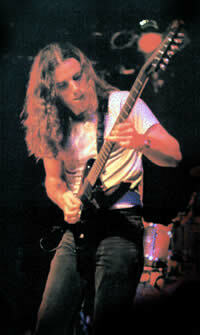 Chuck Schuldiner is gone and more than a year after his death, we would find that he was a hero not only to his fans, but also to his family. This was the most difficult interview to do ever. 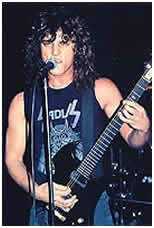 I had the idea in mid November and I decided to contact Chuck's mother, Mrs. Jane Schuldiner. She answered quickly as she does with every journalist and also with every fan that Chuck has in this world. We talked for a long time. After sometime, even I started to have doubts as to wheter or not this interview would be good for her (this was so important) and for Chuck's fans. I thought about giving up on the idea and she also thought the same. The end. No interview. After almost a month, nearing the date of Chuck's death, Mrs. Schuldiner sent me a message telling me that she was fine with the interview. 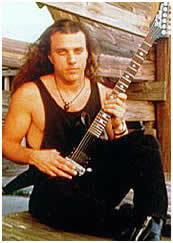 But the period of Chuck's death, and also Christmas time weren't very good to Mrs. Schuldiner. So the interview was ready in the first days of January. This was one of the longest interviews and easily the most touching interview ever. Mrs. Schuldiner opened wide her feelings, the history of her family, of her son. The result of our conversations can give you an idea of how Chuck was as a child, a son, a family member, etc. But it also shows who was behind and supporting him all the time. 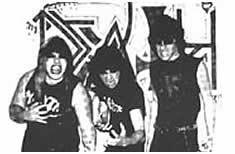 I only hope that this interview was as important to Mrs. Schuldiner as it'll be to Chuck's fans. -How is your life going and how are you a year after Chuck's death? -J: Life is a daily struggle for me without him, Chuck is profoundly loved and missed in so many ways. He was a very loving and caring son, brother and uncle, spending much of his time doing things with us. We had dinner together most days at his house, he loved to cook and barbque and there were many movies, trips, etc. Our lives were filled with Chuck and it is very empty now, for all of us. -We all know something about what happened. But tell us. How Chuck got when he received the result of the exams telling that he was sick? -J: When Chuck got the news of the tumor he was of course upset, but he quickly got into the fighting mode that he stayed in throughout his fight against that tumor. -Do you remember any moment, word or phrase from him to you or to others after the revelation of the disease? -J: When Chuck came into the door of my house and I had to hear those words, I was so devastated. Chuck just put his arms around me and we stood there hugging each other. After I calmed down, his sister, Chuck and I began plans for getting the best help possible. As always, we did it together, as a family. -In that time, was music the only thing that involved Chuck to keep going on and fighting? Or did he search for religion or anything like that? -J: What kept Chuck motivated in his fight was his love of his family, his music and the fans, who responded with tons of mail of encouragment. I can't stress enough the role they played throughout the past three years. And still do. -Do you remember what was Chuck listening to at that time? Any album or artist in particular? -J: I know Chuck listened to music frequently during that time, but I do not know the names of the artists. He wore headphones a lot. Chuck never listened to depressing songs, they were about life, much as the songs he wrote. I do know he received inspiration and gratification by the music he listened to, and as always, CDs were always nearby. -The first album of Control Denied says already a lot in its title, "The Fragile Art Of Existance". Even the lyrics of the songs are very related with what Chuck would live in his next years. It seems like a premonition sometimes. Do you have this same feeling? -J: No, when that album was written it was well before the time Chuck found out he was ill. It surely is amazing that it did seem to be a premonition, and when someone said that to Chuck , he said there was nothing to it, there was no premonition. Chuck was a philosophical person, concerned about many things he saw and experienced himself, and his lyrics reflected that. Chuck was always in great health throughout his life until this happened. -Talking about Control Denied, do the members still have the idea of completing and releasing the second album, "When Man And Machine Collide"? -J: Chuck had completed most of his part of the new Control Denied album and his bandmates are going to make sure it is completed. That was very much on Chuck's mind and we promised him that we would make sure of it. That album is his last, and it was very, very important to him. -After Chuck's death and during his treatment we had some really praiseworthy movements by artists, including some unexpected ones like Red Hot Chili Peppers, Kid Rock, Korn, etc, besides other more metal names like PanterA, Anthrax, Exodus, etc. Did you have any contact with those artists? -J: Yes, I did have contact with them, letters and calls, and they spoke of their sorrow for the tragic end of Chuck's fight for life and their admiration for Chuck as a musician. Some of them were in touch with Chuck when he was in recovery the first time in 2001, giving their support, some very nice caring people. In music there is a kinship, no matter what kind of music it is, and when there is a problem or sickness, whatever, they close ranks and support one another. I admire that because it is rare. -Which were his closest friends in his final days? -J: The people closest to Chuck in his final days were Richard, the drummer in his band, and David, his best friend from 5th grade. Richard was always a good friend and he was there for Chuck throughout his illness, bringing little meaningful presents and sensitivity. He and Chuck always had the same sense of humor and he made Chuck laugh, he lightened all our lives during that time. He has kept in touch and is included in special occasions in our family and is very dear to us. -Before all this... did you have any idea of how much of an icon Chuck was considered to be and how much he was a representative of a style to the music world? -J: I did know Chuck was a force in his music, but not until he became ill was I aware of how very large that force was, and still is. From the beginning of Chuck's illness there were so many emails, letters, and gifts of support from fans that I had to have help answering them. And when they found out that Chuck was being denied surgery because of lack of insurance, they responded with a roar, sending financial support to help him. They were instrumental in helping Chuck get the medical help he needed. I will always feel close to them for that. -Let's get back a bit more. Tell us about Chuck's childhood. -J: Chuck was a great child, loving and always so good natured that everyone loved him back. I always had to caution him against strangers as a child because he thought everyone was his friend. Chuck played baseball and soccer in school, soccer was his favorite. His grades were always good throughout school, and this may surprise some people, but he always got excellent in conduct. We always camped throughout the years when our children were growing up and Chuck loved it, the woods, and fishing, hiking, he loved it all. We moved to this neighborhood next to the forest when Chuck was two years old and he and his friends spent many hours building forts and treehouses when they were children. Chuck always told me that he had the happiest of childhoods, and he really did. -When did he get involved with metal? Before this, what did he listen to? -J: Chuck got involved with music when he was 9 years old. His brother, Frank, was killed in an accident. They were so close and Chuck was devastated, so we bought him a guitar and took him for lessons. He loved playing but got tired quickly of the lessons, and continued playing on his own. He heard Kiss play and they were his favorite band for years, having quite an influence on him. Jimi Hendrix he thought was fantastic and he also liked The Doors. When he was thirteen years old I took him to his first Kiss concert. -When he started to play guitar and Mantas later turning into Death, what did you think? Did you approve his decision? -J: I suppose it was because Chuck was never a problem child that I accepted his music and thought if he liked it, then it was okay. Chuck always loved animals and cooking, he told me once that if he had not been a musician he would have been either a chef or a veterinarian. I always thought that the name of the band derived from the death of his brother, and while the word had such painful memories, I did not object. -Did you like his music? Since the beginning, did you listen to his records and enjoy them? -J: Chuck's music was very loud and it took me some time before I really listened to it with a critical ear. I have always loved the drums, and early on I loved the way Chuck could play the guitar, always amazed at the progression of his talent as he taught himself. Chuck could play a lot of instruments. He was such an interesting person, and my garage was always full of young, hungry musicians. Great young people. -Was Chuck a 24hrs a day metal man? Which other styles he used to listen to? -J: Metal was the music Chuck listened to mostly, though he liked Jazz very much also. There is no music that I don't like. I always have either the radio or television on turned to the music stations. Chuck did not like country, thinking it a sad music. -Besides the 2nd Control Denied's album, is there more unpublished material that probably will see the light soon? -J: I did find unpublished songs that Chuck had written and lots of demos and there was music he had written for a friend in another band, but when I asked his friend about it, he didn't think he would go forward with their plans for it. I don't know what plans we have for all of those. -Which are the last words that you remember Chuck saying to you or to another person? -J: Chuck's family were around him at the last and many words of love and comfort were spoken. It felt as though my heart and soul were breaking, and I still feel that way. 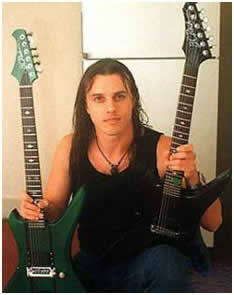 -Mrs. Schuldiner, thanks so much for the interview. We know how hard those times are and you can count with us. This space is yours to leave a message to Chuck's fans, friends... and whatever you want to do. -J: I want to thank you, Thiago, for your patience. Some of the answers were very difficult and it has taken me a long time. My message to Chuck's fans and friends are very much what I wrote in his memory December 13th of this year. Thank you all for your continued support to me and Chuck's music, he would be so proud.